The VEXXHOST team is thrilled to announce that we are currently running Stein, OpenStack’s latest and 19th official release. Last year, we were the first company to have OpenStack’s Rocky release up and running, impressively deploying it on the same day it was launched. 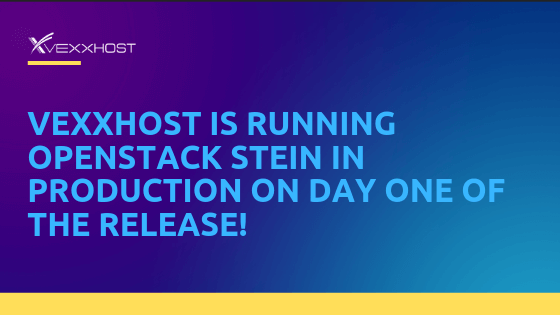 VEXXHOST is proud to say that this release is no different, with this announcement being made alongside that of Stein’s official release from The OpenStack Foundation. An immediate advantage of this update is that we’re able to offer each of our clients extremely high stability, while another key benefit for our users is the availability of the latest version of Kubernetes, version 1.14, as well as the increased speed with which users can deploy a cluster. This upgrade, executed by our engineers, was carried out in such a smooth manner on both public and private clouds that clients were completely undisturbed, enjoying a seamless transition. As a result, the VEXXHOST team is the first to have a production-ready private cloud running Stein. Furthermore, we’re ecstatic to have been deeply involved in the development of OpenStack’s Stein release and are proud to have contributed to making this upgrade possible through working with upstream. This not only shows our adeptness and level of expertise in OpenStack software but also demonstrates how we have become the strong and trusted partner that our clients rely on. If you or your company is ready to explore the new features of Stein or looking to step into OpenStack technology for the first time, simply sign up to VEXXHOST’s OpenStack Passport Program for a free trial today.